I want what I want. I wanted to paint my kitchen lavender, despite the fact that I knew that there were little to no kitchen accessories that were going to be easily purchasable that would match. I whipped out that paint brush anyway. Then I proceeded to moan and complain about I couldn’t find a thing to match my kitchen… How frustrating! Well, when you’re the type of person that wants what you want, you had better be crafty. After unsuccessfully looking for rugs, curtains, etc. that I liked and went with my unique kitchen color scheme, I decided to get off my rump and DIY it. First on the agenda? Some of those squishy comfort rugs to put in front of my sink and my stove! I went to Wal-Mart where I purchased some rugs with a photo of oranges on them for $7.97 each. You may like them, and if you have a cute, kitschy, vintage kitchen, they might work for you – but I think they are hideous. Luckily, I have a big ol’ bottle of Mod Podge. As my nephew says (frequently) – Let’s get this party started! 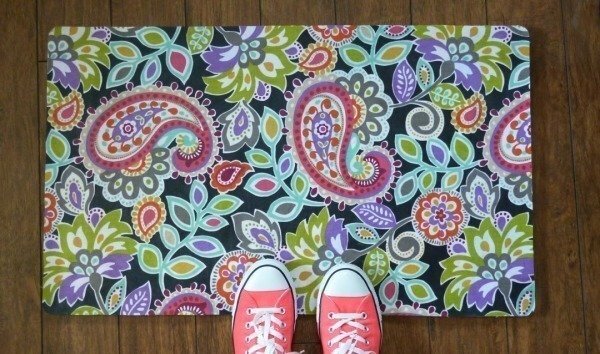 For this project you will need: Squishy foam rugs, fabric (I used printed canvas), Mod Podge, cheapie foam brush, scissors. STEP 1: Cut a piece of your cloth to where it extends past the edges of your rug by about an inch. If you have some awful wrinkles, you may want to give the fabric a quick press. STEP 2: Apply a very healthy dose of Mod Podge to the top of your rug working kind of quickly since this is glue and you don’t want it to dry on you. Be sure to have a generous slathering around the edges and corners. Take your piece of cloth and place it on top, smoothing out any creases, wrinkles or bubbles. Pull up the corners and give another thick dab of glue and push back down. Allow to dry for several hours. STEP 3: Flip your rug over to where you are seeing the back side. 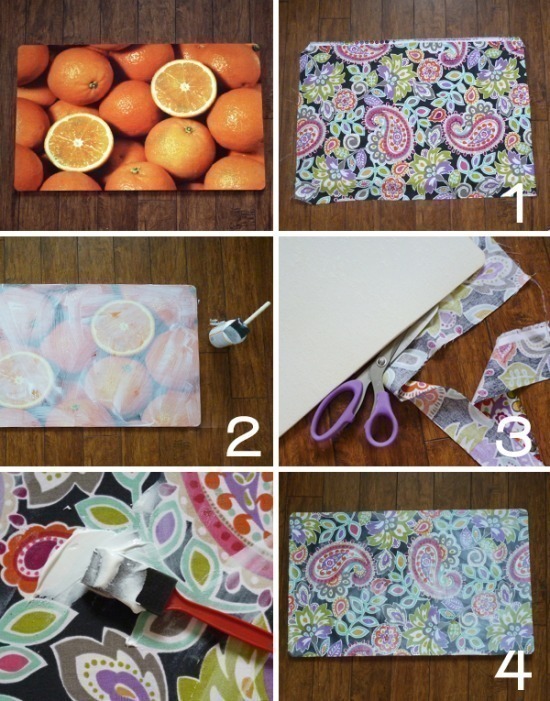 Using your scissors, carefully trim the excess fabric. This foamy rug stuff isn’t really tough, so be careful that you don’t cut a hunk out of the rug accidentally. STEP 4: Flip your rug back over and apply a nice, even layer of Mod Podge over the entire thing. I decided to try out my new bottle of outdoor Mod Podge for extra protection against water (because, like with everything I do, I wash dishes with gusto and wind up with the front of my shirt and the floor below me soaking wet). Let the rug dry over night. Trim up any weird spots or frays along the edges. So, that’s all there is to that! You have comfortable squishy custom kitchen rugs that match your kitchen perfectly. Aren’t you excited? I am!!! I can't wait to try this! Thanks for the tute! You are very welcome, Heather :) Thanks for stopping by! I made three rugs yesterday following your steps! It was so easy! They look fantastic! Thanks for sharing!! did you find that if you moved the rug, the wood flooring underneath became very slipper?? Hi Val! I took my photos on wood but my rugs actually sit in tile. I have not had the floor get slippery but I did one time have the rug kind of 'stick' to the floor. My sink overflowed so I think that so much water was the culprit. It was easily solved by peeling it up with no damage to the floor. Oh, and the fabric has stayed securely on in spite of my enthusiastic style of washing dishes! Sorry to not be of more help. My rugs get so dirty – do you think there would be any way to clean these? Thanks! Hi Kristen – I've had my rugs in use for about 3 months now. I'm really splashy at the sink and so they get wet all of the time and have done well with that. I normally manage to get to spills etc. on them pretty quickly, but when my nephews left after their last visit, I noticed that they were FILTHY. Including something that may have been pudding or something simlilar that hardened. II busted out my Fabuloso and a scrubbie and crossed my fingers. Save for the edges where I should have been more careful, it was totally fine. So, my advice is YES they are easy to clean (when using outdoor Mod Podge to seal them), just be conscious that you can undo the glue at the edges when scrubbing them down. Best of luck! Hi ! I will defintiely try this!! looks beautful!! Maybe it will hold up against my crazy 3 dogs and 2 cats and one grandbaby!! Hey, Alison, just be sure to stick the edges and corners really well. Mine are considerably old and every once in a while when they get heavier wear I have to glue the edges down but I am really happy with them overall. This is such a good idea! 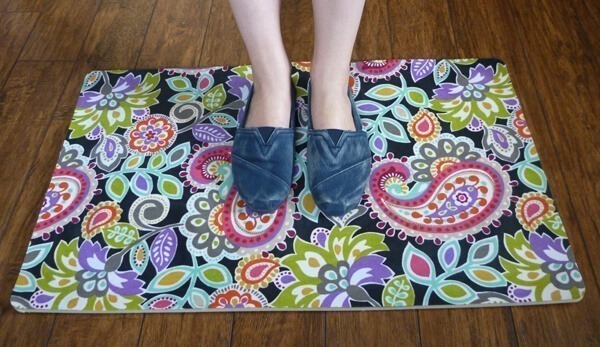 Next time I see a cheap foam rug, I know what I will be doing! I'd love it if you would link this up to my new linky party, "What We Accomplished Wednesday." It is live right now. Have a great week! Thanks much, Deborah – will do on the linky andl see you there!